So this dish I made with the intention of my husband and I eating for lunch. But it could certainly be a main dish in and of itself, or a delicious side dish with some grilled chicken or steaks. The reason I made this as a “lunch dish,” is the Brussels sprouts. My kiddos are fantastic eaters, they love most green vegetables, but 2 out of the 3 of them “draw the line” at Brussels sprouts. And I didn’t want to waste all this delicious-ness on kids who wouldn’t enjoy the meal! I’ll share the recipe as I made it, but note that it is heavy on the lemon flavor…as that’s how we prefer it. You could try using just 1 lemon, and then adding more lemon juice as your taste buds prefer. But in general, lemon + bacon + Brussels sprouts = fabulous flavor. I hope you enjoy this as much as Steve and I did!!! In a saucepan, cook the quinoa according to package directions. (Takes about 20 minutes.) Remove from heat once done cooking. In a large skillet, add the olive oil, the halved Brussels sprouts and any stray leaves, the crumbled bacon, and the minced onion (finely chopped small white onion works too.). Squeeze the lemon juice into the skillet as they are sauteeing. Saute over medium-high heat for 5-7 minutes, or until Brussel sprouts have turned bright green and browned slightly. Remove from heat to prevent overcooking and burning. Stir in the pepper and salt, to taste. 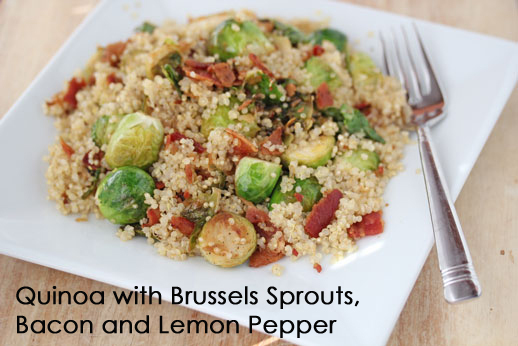 Toss the bacon-Brussels sprouts mixture with the cooked quinoa. Serve warm. Is a good food to health. If I put 1 lemon? it’d keep good?